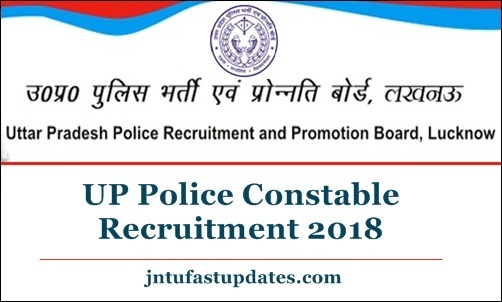 UP Police Constable Recruitment 2018-19: Uttar Pradesh Police Recruitment and Promotion Board (UPPRPB) announced a large number of constable vacancies this year. The UPPRPB has announced a recruitment notification of 51216 constable posts for Constable Civil Police, Constable in Reserved Territorial Armed. This notification was released on 19th October. And the online application process for UP Constable Posts will be started on 10th November and the last date to apply is 30th November. Aspirants waiting for UP Police Constable Notification can utilize the opportunity by applying for the announced posts. Interested and eligible aspirants can apply through online at uppbpb.gov.in. Before applying for the announced posts, candidates can download UP Police Constable Notification 2018 PDF thoroughly for more details. Uttar Pradesh Police Recruitment and Promotion Board (UPPRPB) annually comes with various recruitment notifications to appoint the suitable candidates in required places. The UPPRBP has notified a large number of police constable posts. The department has announced 51216 constable posts for Constable Civil Police, Constable in Reserved Territorial Armed. Interested and eligible aspirants can apply within the announced dates. Applicants must have the minimum educational qualification of class 12th from any recognized board. Aspirants must also have suitable physical standards to apply for constable posts. Aspirants seeking to apply for the posts of UP Constable must have 18 – 22 years for male and 18 to 25 years for female candidates as on 01.07.2018. Applicants must be born between 20.7.1993 to 01.07.2000. Selection of candidates will be done through written test, physical standards test, physical eligibility test, and interview rounds. Applicants must have the minimum educational qualification of class 12th from any recognized board. Aspirants must also have suitable physical standards to apply for constable posts. Aspirants seeking to apply for the posts of UP Constable must have 18 – 22 years for male and 18 to 25 years for female candidates as on 01.07.2018. Applicants must be born between 20.7.1993 to 01.07.2000. Candidates shortlisted for the announced posts will get a pay scale of Rs. 5,200-20,200 Grade Pay Rs. 2000/-. How To Apply for UP Police Constable Posts 2018? Interested and eligible candidates can apply through online on UPPRBP Official website, uppbpb.gov.in. Interested and eligible aspirants need to apply from 19th November to 8th December. The online application will be accessible on UPPRPB postal during these dates. Candidates have to scan the required documents to attach to the application form.